I thought you'd all like to see a picture of the latest future media star named after our own Julian Barber. She's ....that's right.....SHE'S Jillian Hickman, age 2 months and the newest of Julian Barber's grandchildren. Jillian is the feminine version of the name Julian. Jillian is shown here flanked by her two beautiful sisters, Ava Rose (L) 4 years old, and Mia Lily 3. 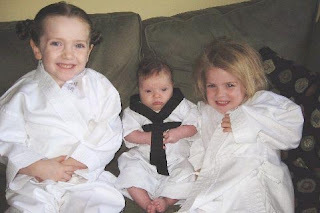 Apparently all three are karate experts and I think Jillian's ribbon indicates that she is the world's youngest Black Belt.